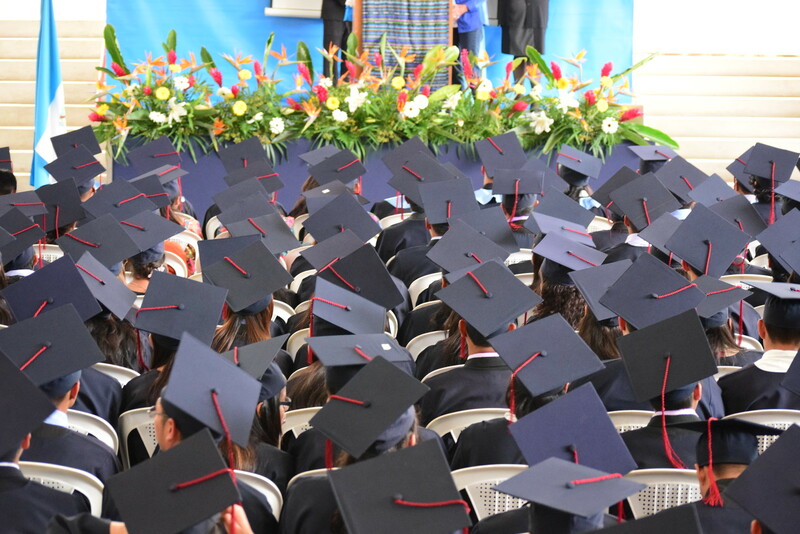 I was so thrilled and humbled to join this year’s graduation celebration in Guatemala along with 50 guests from the U.S. and one incredible family who made the long journey from the Netherlands. Three weeks have passed since then, but the excitement of that day is still with us and I feel it multiplying – like ripples in a pond getting bigger and bigger as they spread outward. Graduation Day represents the culmination of our work as an organization. These students are 171 living, breathing testaments of Common Hope’s desired outcomes. For the students, graduation is the day they have worked towards for so many years. Their sacrifices, and their parents’ sacrifices, have all led them here – to The Pathway of Dreams, where their names are literally set in stone. I’ve walked down that pathway many times before, but never understood its paramount significance until I watched students excitedly find a brick with their name on it. Throughout the day I was witness to so many joyous moments, starting with the graduation picnic. To see the sponsors celebrating this long-awaited occasion with their student and family was truly heartwarming, like a big family reunion. Big smiles and jubilant laughter came from all around as everyone shared stories, memories, and plans for the future. We listened as parents Maria and Rigo gave emotional testimonies, telling everyone in attendance that their support helped them through difficult times and that those gifts will last a lifetime. Jose Miguel, a father from San Rafael, traveled to Antigua that day to say thank you on behalf of his family and present a very special gift to everyone who is a part of Familias de Esperanza. Over the course of that afternoon I saw students, parents, sponsors, and staff members in tears. I had tears of my own. In that moment, the impact of what graduation means for our students and their families becomes so real that it’s overwhelming. You start to understand how that diploma will affect their lives, their futures, the future of their families, and the future of their communities– a ripple effect on humanity. That ripple starts with you, our supporters. The generosity you show Common Hope allows our staff to deliver life-changing programs to students and families, and together we walk hand-in-hand on the path to success. So on behalf of everyone in this Common Hope family, THANK YOU for all you do to make milestones like graduation possible. I would like to leave you with a beautiful speech given to the students during the graduation ceremony by Flor García, Common Hope’s Educational Support Programs Manager. We’re coming to the end of the ceremony, and with that we are also concluding a journey that began with your affiliation, a path of a thousand dreams. When you entered the Foundation [Common Hope], your parents brought you with the HOPE for a better future for each of you. Your sponsors decided to support you with the HOPE that education could transform lives. We, the staff at Common Hope accompanied you with the HOPE that you would achieve it. We saw you work hard, we saw you struggle, we saw you triumph, and at other times we saw you fall then get back up. We ALWAYS believed you could do it. Today, you will walk out these doors and carry with you not just HOPE, but also the preparation to face the world. Always hold HOPE in your hands like a light, and know that it’s made of love, of dedication, and the certainty that each of you us unique, important, and valuable. The doors of this house are always open to hear what you’re up to. It’s more than a brick with your name that you leave here; it’s a testimony that you can achieve what you dream.